Hippocrates, the ancient Greek doctor certainly got that right! ‘Art is long and life is short’. Art influences how we see the world and it gives us a means to express ourselves when words cannot. Certainly the impression a piece of art makes on the viewer can outlive the ability to recall the artists’ name. Yet finding a simple drawing you stored long ago, can flood you with treasured memories of the artist if it was your child. Giving recognition to a child’s artwork can build life confidence equal to scoring the winning homerun in a champion little league game. I’m at least as proud of my trophy from a city-wide art contest in the third grade, as I am of my Best Girl Athlete medal from seventh grade. As parents and educators we know how essential art is to teaching and encouraging our children. Since art is such a vital part of raising healthy children, shouldn’t we consider making sure the art supplies our children use to create their art is healthy for them too? Art supplies often contain toxins and pollutants that are both harmful to a child’s health and the environment. Many art supplies contain toxic chemicals (PBTs) that can accumulate in the environment when they are made, used or discarded. These PBTs can also accumulate in your child and cause illnesses such as headaches, breathing problems, nausea and possibly worse. With Spring Break just around the corner, now’s a perfect time to consider some environmentally friendly ways to spruce up your family art projects. Juniors’ masterpiece will last just as long and look just as good on 100 percent post-consumer recycled paper as it would on virgin paper. Who doesn’t love coloring? But traditional crayons are made from a non-renewable petroleum byproduct, paraffin wax. Look for crayons made from soy bean oil. 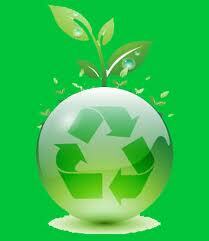 Not only are they non-toxic, but they’re bio-degradable too. Looking to channel the Italian street artist within? Organic chalk with all natural ingredients is totally safe for small children. They can decorate away without you worrying about them putting their hands or the chalk in their mouth. Eco-friendly colored pencils are my ‘tool of the trade’ and I use sustainably harvested wood ones like the ones found at Stubby Pencil Studio www.stubbypencilstudio.com. Manufactured from California cedar wood and certified by the Forest Stewardship Council to have originated from environmentally well-managed forests they draw great cartoon aliens, flowers, trees and dinosaurs. You’re never too old to enjoy a day of finger painting! It’s simple to mix up a batch on your own. Form a smooth paste with a cup of white flour (not self-rising) and 8 tablespoons of water. Separate small portions into muffin tins and add organic food coloring to get the color you want. Thin to a pudding consistency with additional water and you’re ready to create a Picasso. Fancy yourself more of a Monet? Create watercolors by mixing 4 tablespoons of baking soda with 2 tablespoons of vinegar. Allow the mixture to rest until the fizzling stops. Then add 2 tablespoons of cornstarch and ½ tablespoon of corn syrup. Mix until crumbly and divide in a muffin tin. Add about 10 drops organic food coloring to each cup. Paint away, mixing individual colors together to create a wide palette for your masterpiece. Our recipes wouldn’t be complete without offering one for eco-friendly play dough. Mix 1 cup white flour (not self-rising) with ½ cup of table salt in a bowl. Gradually add 1/3 cup water while kneading the mixture until it reaches a dough consistency. It should not be sticky. To tint the dough, add organic food coloring as the dough is mixed to create various shades. Store in the refrigerator in a well sealed container, but like all play dough – it will eventually harden. Danville and Alamo K-12 students are invited to participate in the Town of Danville 2012 Earth Day Art Poster Contest with the environmental theme of “Our World, Our Community”. 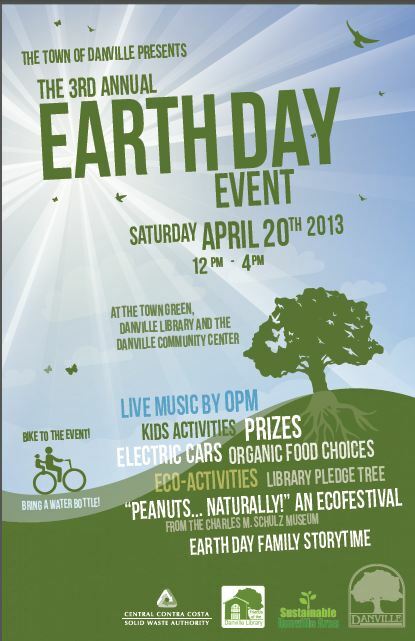 All the students’ art work will be displayed at the Town of Danville Village Art Theatre Gallery on Friday, April 20th 11-5pm as part of the town’s Earth Day Celebration. A reception honoring our artists will be held at 4pm. Prizes will be awarded to finalists in each of the following grade categories: Kindergarten, Grades 1-3, Grades 4-5, Grades 6-8 and Grades 9-12. 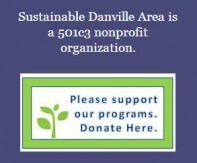 For complete instructions, please visit http://sustainabledanville.com/2012-earth-day-student-art-poster-contest/. All art work must be submitted by entry deadline: 4pm April 17th.